It’s come and gone and all that planning and setup is all in the past. As I have mentioned previously our neighbors have been very welcoming and I felt that we should show our appreciation so we decided to have an Open House for the Neighbors. All Neighborhoods in Sun City are designated by a Neighborhood Number, we happen to be neighborhood 60. Relative to some neighborhoods ours is on the rather small size. It doesn’t matter the size, it’s the quality of the neighbors and I think we hit a winner. So out went all the invites and to my surprise the majority responded they would be attending. We have some single men and ladies on our street and except for the singles not attending all the couples in our neighborhood responded. So once that was all added up we were up to 50 people. Yes, that does seem like a lot of people, but it’s amazing how you really don’t need that much space to accommodate 50 people. The actual day of the party we had a few that could not make it, but the total attending was 45 people, not a bad showing. We have a rather large garage and on a scale of 1 to 10 for cleanliness ours is probably a 9. This is my husband’s domain and he sure does like a clean and organized garage. So it was an easy decision to include the garage as an option to include in the space we would use for the Open House. So after deciding that the bar would be setup in the garage and the food would all be setup in the kitchen we had a plan. What we quickly learned is that everyone in the neighborhood is more than willing to help out and share. We borrowed tables and chairs, and even 2 heaters, just in case we needed to get the chill out of the garage. It was a beautiful day so by the time of the party at 6:30 the garage warmed up quite nicely. And I will say when you get 45 more people in your home that body heat really warms up the place. Also, when you have this many people it is extremely difficult to provide all the food, and very expensive. 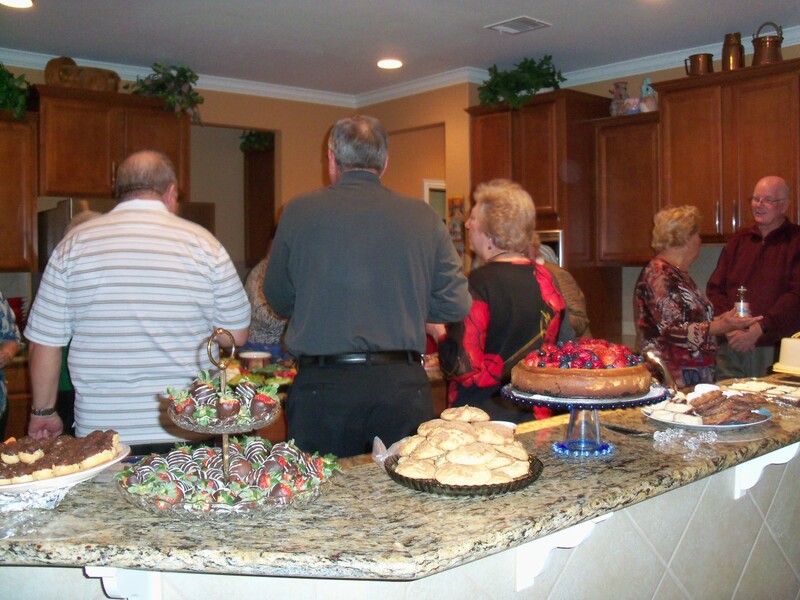 So we provided the drinks and everyone brought a dish to share, either an appetizer or dessert. My counters were full, but what was great is that by the end of the evening most dishes were either empty or near empty. So once all was bought, borrowed, setup, and food made we were ready for the start time. I truly appreciate the time awareness that the neighborhood has. When you say a party is from 6:30 to 9:30 people show up at 6:30 and the last person left at 9:30, now that’s a great thing. Besides we’re all getting older and don’t stay up late like we did when we were younger it’s nice that they respect the invite times. I know we enjoyed the Open House and from the general feedback I believe all that attended had a good time to. It’s not what you cook or how it all looks, it comes down to the people attending and the fun that you all make together. I felt a part of the neighborhood before, but I feel even more involved and closer since our party. I have said it before and I’ll say it again, this is one party happy neighborhood. We’re enjoying our life here in Sun City and have absolutely no regrets regarding our decision to move here, or neighborhood has made this an easy transition. To our continued travels in and around Sun City and hope that your road choices are just as fun……..
It’s been awhile since I last posted, and as I look back over last month, January, I wonder where the time has gone. We moved to our home in November, we are now in our 3rd month and I can say that there hasn’t been one day that I have sat here and said I have nothing to do. I had expectations before we moved here, just like when you start anything new. Whether it’s a new job, starting a new excercise program, taking a class, you go into your project expecting something from it. Sometimes you are disappointed and other times surprised because the outcome surpassed what you thought would happen. Before we moved here I remember telling friends that if only half of my expectations are met, I will be happy. I can honestly say that this is a time in my life that my expectations have been met 100%. I have been retired since September, and I can say living in our previous home, if it wasn’t for the packing and preparing to move out of our home, I was on the road to boredom. I found myself very aware of the time of day, and found I had more down time then I really was happy with. Since moving to Sun City, it has been the opposite and we haven’t even scratched the surface of all the things we want to do. We certainly did jump right in, but because of that we feel very much like we belong, and not an outsider looking in. We are involved in multiple neighborhood game nights and asked to sub on more. We have attended dances and have started taking yoga classes. I really do enjoy the Line Dancing Club and look forward to our monthly ladies luncheons. Our neighbors have included us with open arms, they couldn’t be nicer. This has helped achieve my expectations. We have a big Open House planned in February, and am looking forward to it. People I didn’t think would come are coming, so definitely more than expected, so I guess some will just have to stand, or we’ll take turns sitting. Either way I’m sure we’ll have fun. We have parties planned out to June, that’s one thing I can say is that you certainly do get enough notice about attending a party. Now put all these activities together and consider we just moved into a house that we are painting, putting knobs and handles on all the cabinets, shopping for some furniture and general house fixing up, every day is active and we’re busy. What’s nice to know is that the house activity, such as the painting, etc… is coming to a close so we’re going to have more free time. I am not worried about this extra time, but actually glad it finally has arrived as we are looking forward to even more activities to get involved in. We are going to join the Country Dance club, learn how to play Pickle Ball, play a little Shuffleboard, and even get back into the swing of things by pulling our golf clubs out of storage and seeing if we can still hit that little white ball. We will be joining the ranks of other Sun Citiers and will have our Golf Car very soon. There will be days now that I won’t even have to pull the car out of the garage, we’ll be able to attend all of our activities using the golf car. The day has arrived! The next level will be joining these additional clubs, but then we need to go further and consider some day trips, and outside activities, that will be the final stage to total involvement. I consider us lucky. Our neighbors have been welcoming, they have given us direction and helped us become absorbed in this lifestyle very quickly. I know all don’t experience this type of immersion. Sometimes it might take a while, but if you’re willing to put in the effort it’s there for the taking. What I’m looking forward to is the opportunity to continually meet new people. We enjoy our neighborhood and all the activities it brings, but what also we’re looking forward to, is having a chance to meet the 5000 other people who live here. Of course that’s silly, we’ll never meet them all, but I’m certainly going to give it my best shot. We’re off on a new month, the weather is getting better, the sun is shining bright and I’m looking forward to each new adventure that is around each and every corner. Keep your travels safe, we’ll be traveling close to home for a while, but whether near or far, it’s not the destination, but the time it takes you to get there. Enjoy your travels………..
It’s the start of the first full week of the new year. Kids are back to school, people back to work, relatives have gone home. It’s back to reality for most people, of which I was one of those “most people” for years. The build up to the Christmas season was tremendous, the pressure, the rushing around, the shopping, visiting, cooking, and of course presents. Then New Year comes and it’s all over and peace and quiet sets in. I always disliked this part of the year because the companies I worked for did not get off any holidays in January, February, March or April. No Good Friday, No Easter holiday, no Presidents Day, etc… it was 4-1/2 long months of no Holidays until Memorial weekend. It was horrible just thinking about this stretch of time. Almost every year that I worked we planned a trip for sometime during this time period. Not only were there no days off, living in the Chicago area, it was snowy, cold, cloudy, and just plain dreary. And then when you thought Spring might be coming because you got that one beautiful day in March or April, you realize it was an exception and that you have another 6 – 8 weeks of not so good weather. Well, I can happily tell you that times have changed, and changed for the better since I retired. First living in Texas versus Chicago gives us better winter weather and more sunshine. I will tell you don’t think Texas doesn’t get cold and cloudy, it does, but we always remember, never as long or as cold as up North. You might get a few cold/rainy days, but then it warms up. I can live with rain any day over snow. We have had some really cold weather the last two weeks, but as many times as we drop in the 30’s or 40’s, up north is going down to zero or the teens, so relatively speaking, not bad. I will go on record though, if you want warmer winters its Florida that you want to go to. Florida is more temperate and the swings from highs to lows are smaller than Texas, and generally the overall temps are higher than here in the winter. So onwards to this time of year and now. I was up at the Sun City Fitness Center and a man came by and was very happy. He said he felt he was on a cruise ship with so many endless activities to do. I have thought about that and I agree. Sun City is like a party on a big cruise ship. There is one important factor, and something people must know. The activities, people, socializing will not come to you. You need to be pro-active and be willing to talk with people, be sociable, join the fitness classes, participate in the dances, shows and for sure join some of the activities and chartered groups. You have to remember that many people have been here for years so you’re not just going to join a group and wham, you’re in the click. Yes, the woman have formed friendships already and it’s not always easy getting “in”. But there are new people moving in every day, so at some point your will meet someone who is also looking to meet people and it just starts growing from there. 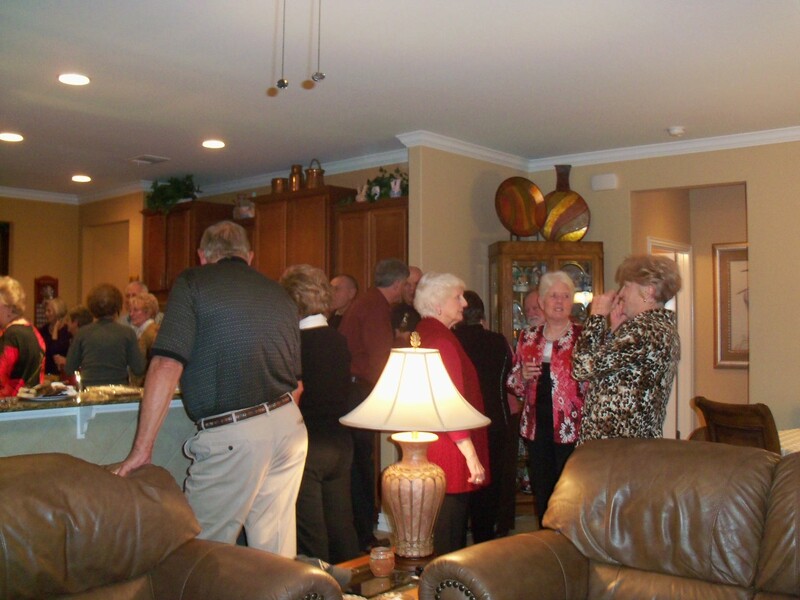 Not only does the Community Association have many activities, but there are chartered groups and a nice side perk is to move into a sociable neighborhood. We think we got lucky. In addition to all that Sun City offers, our neighborhood has been very accepting and we are in 3 game nights and subbing on 3 others per month. Our neighborhood has woman’s lunches, men’s lunches, monthly get-together, and 3 Holiday parties a year. Are all neighborhoods like this, from what I heard, I don’t think so, but as I mentioned that’s just a perk. All these things our neighborhood has you can find if you join the Zoomers, or some of the other clubs. But the secret, and it’s really not a secret, it’s plain and simple; be pro active in expressing what interests you, ask questions, ask for help, and be willing to try things to see if you like it or not. This is your time. It doesn’t cost you anything to try, it’s free. A fine example is I always wanted to tap and/or clog, so I’m trying that now for the next 2 weeks. Pickle Ball is next on our list and I have a few more fitness classes I need to try out. I’m going to start attending the Zoomers activities and I’m going to start Line Dancing, Square Dancing and join the Country Western Dance club. All these things I just never had time for. Wether it feels like you’re on a Cruise ship, or a kid in a Candy Store, you can be as busy as you want. The point of moving here is not to sit in your house, but to enjoy what your annual dues are paying for. We didn’t move here for the home, the way it was built or how it looks, we moved here for the activities and having a place that everything we want to do it right in our community. There are many days of the week I never have to leave our community, it’s all right here. But, don’t forget Georgetown either. I’m going to my first Newcomers meeting on Thursday. I understand these groups are in many towns but again just never had the time, so again I inquired and I will be joining one of my neighbors as she is a member and will introduce me around. What a wonderful way in join a new community. It’s a good thing I love talking with people! I hope your New Year’s road will be happy and fun. I’m now starting our 2nd full month in this new community, and the Holidays were rather slow, but I can tell you that even after our short time here, and even thru the slow period I have absolutely no regrets that we sold our home and moved here. My husband (Mr. Anti-social) is starting to come around and will actually be going to his first men’s Luncheon; it’s a beginning for him. I hope you can tell by reading this I am thoroughly enjoying our new road we are traveling. I actually think we are still in the infancy of what is yet to come. Be happy, be safe, and drive carefully down your road you are traveling on……………until next time. PS I promise to add more photos soon!